The Gathering is held annually on the first Saturday in March at Rhodes Park in Concord. In 2016 it will be on Saturday 5th March, commencing at 10am. You are invited to join us to celebrate your ancestors’ connections to Hill End and Tambaroora. Some people arrive with morning tea, others bring lunch and a few arrive with afternoon tea… the keen ones will be there for breakfast! It is a very free form gathering and is an excellent opportunity for those with ancestors from the region to meet with others who have a similar interest. Initially started as a reunion for those who lived in the Hill End & Tambaroora area to get together, the Gathering is gradually evolving into a meeting place for those with links to the district to join in as well and share their experiences and family history research. 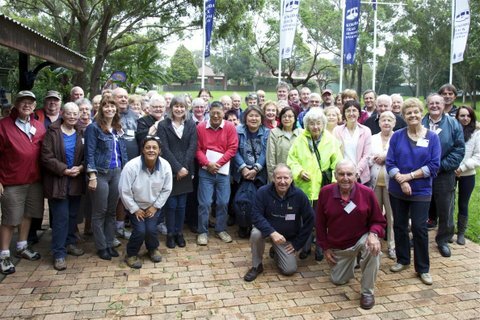 Rhodes Park has now become our new “home” (after 70+ years meeting in the Royal Botanic Gardens) and caters well to our requirements. We were sad to leave the Sydney Botanic Gardens but our new venue provides public transport access, plenty of parking, toilets and a Kiosk and a large Shelter Shed which we have booked solely for our use all day. There will also be a selection of reference materials on display & available for perusal on the day. Boiling water, and coffee & tea making facilities will also be available. If you wish to purchase any of our publications these will be available for sale as well. Unfortunately we do not have credit card facilities however cash or cheques are acceptable. What do people bring? As in the past years the following suggestions are a few ideas that have come to mind…. Well, there are some tables and seating available in the Shelter Shed but if you are coming by car, it might be a good idea to bring along your lightweight picnic chairs/table or picnic rug, so we can spread out and be comfy. Bring your morning tea, lunch, afternoon tea, and whatever “refreshments” that will be needed to sustain you for the day. There is also a kiosk adjacent to the Shelter Shed, with coffee, soft drinks and a considerable range of refreshments available for those travelling a long distance and who don’t want to bring refreshments with them. Bring a couple of copies of the “potted” version of your family history, including photos (but remember that old ones are easily damaged by handling, so perhaps now is a good time to have copies made and these can be made available for others to have a look at – leave the originals at home!) This may be an opportunity to swap stories and information. Wear a name label with your name on it, (in LARGE PRINT so others can read it without glasses!) and also the main family names that you are associated with. Maybe a large sign, with the family name, that can be put on your “campsite” so that others can make themselves known to you as well. Notepad and pens etc to jot down the contacts if necessary and camera to get that memorable shot. If you have the opportunity to prepare a small “handout” that gives your name and contact details and the families that you are interested in (no more than a page), it may be worthwhile. Make a few copies of this that can then be swapped if you find others have a similar interest. – saves a lot of writing down in the excitement of the moment of finding others “doing” the same family. So, there you have it! This may be an opportunity to meet the faces that match many of the names we have been corresponding with in the past 12 months. It is also an opportunity to renew the friendships made at previous reunions. As it is a very informal get together there is no need to “book” to come to the gathering. We’re sure to all fit in! Our venue should also provide sufficient shelter if the weather is inclement. Train to Rhodes Railway Station then short walk downhill to cross Concord Rd and on to the Kokoda Memorial Walkway at Brays Reserve. Use the Metrobus system to access route M41 from your local interchange or from Burwood Railway Station(runs every 20 mins) OR Route No 458 from Burwood to Ryde. Ask driver for closest stop to the Kokoda Walkway in Hospital Rd. (outside Concord Hospital) . From here it is a 5 minute stroll along Fremont Street to the park. Free timed parking is available at Rhodes Park, via Hospital Rd, Fremont & Killoola Streets or at Brays Bay Reserve off Concord Rd. Stroll along the Kokoda Memorial Walkway to the Shelter Shed. Parking is also available at Concord Hospital car park on Hospital Rd. A parking fee applies. Please note time limits on parking in surrounding streets and remember to move your vehicles if necessary.